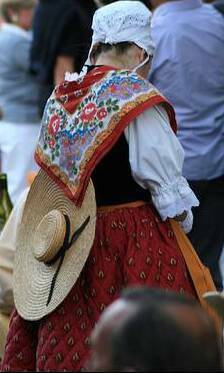 Today i will talk about a Provençal costume which I made for my friend Joan recently. She is very involved with French culture, works as a translator from French, and is active in our folk dance group. 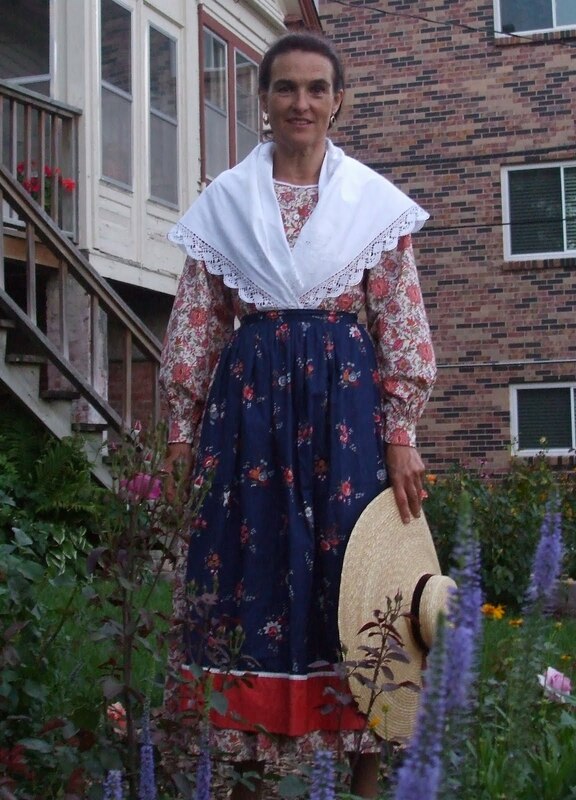 When we were going to attend a folk dance workshop which included an instructor of French Folk dances, Marilyn Wathin Smith, we decided she should have a French Folk costume for the occasion. 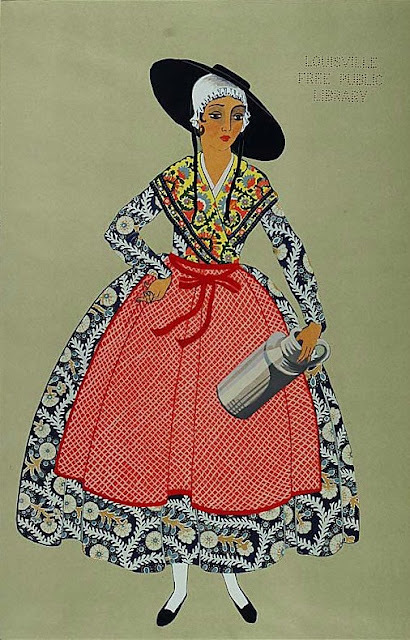 French Folk costumes are always referred to according to the old Provinces. 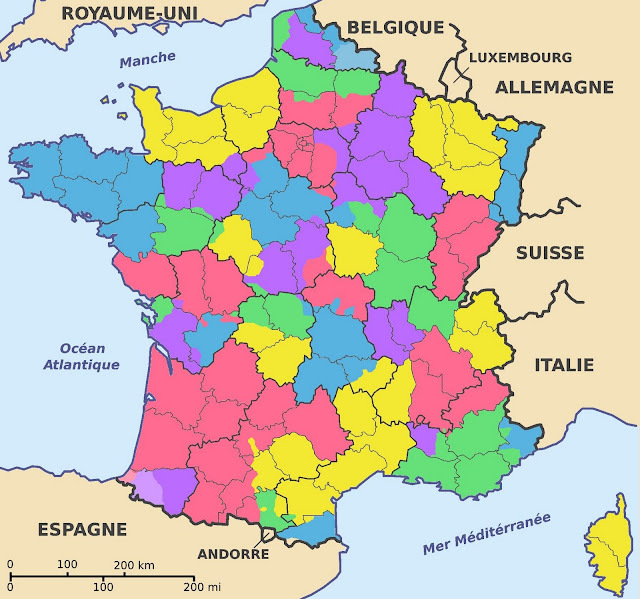 If you look at a current map of France, the divisions you will see are Departements, which are purely administrative. The old provinces are connected with the traditions and identity of each area, They vary in size, and the exact borders have varied through history. Here is a map of France showing the current departements superimposed on the more complicated version of the old Provinces. The traditional extent of Provençe is shown in green in the southeast corner of France. I am not sure why the small area in violet on the northwest edge is separated, this is often also considered to be part of Provençe. Here is a closer map of the area, this also includes the departement just to the north, which is part of the alpine region. 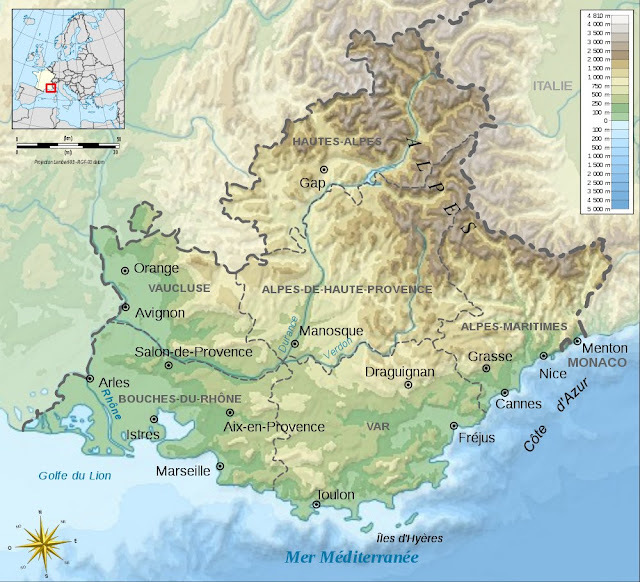 The costume region we are going to talk about today includes the departements of Vaucluse, Var, Bouche du Rhone, and adjacent parts of the other two. The people of this region traditionally spoke Provençau, a dialect of the Occitan Language of southern France. This has been mostly displaced by French according to the policy of linguistic uniformity promulgated by Paris in the early 20th cent. A minority of people in the region still speak it. For further information on the history, language and culture of Provençe, see these articles. I will be addressing specifically the costume of Lower Provençe, Upper Provençe refers to the higher areas further north into the mountains. Besides the more general one, the costume from the area around Nice is somewhat different, and the costume of the city of Arles and its environs is very distinct. Each of these three costumes is often portrayed as the Provençal costume.There is a famous series of prints by Gardilanne, portraying the costumes of France. This one depicts a milkmaid from St. Ferre, close to Marseille. Here is a photograph of a couple of ladies from St Tropez in traditional costume. 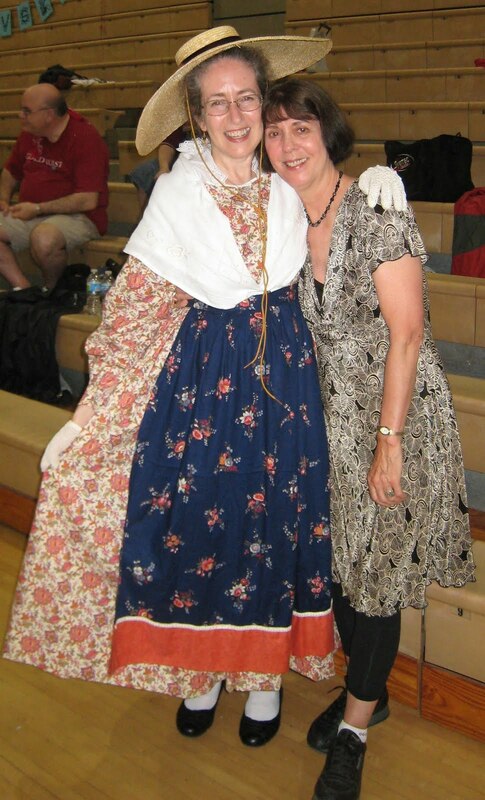 And here is my friend Joan posing in her Provençal costume with Marilyn Wathin Smith, a noted teacher of Traditional French Dance, at a workshop which we attended with her. The costume of this region comes in three variants which belong not to different geographic regions but to three different social classes, Paisanne, Artisanne and Bastidanne. Paisanne means Peasant, Artisanne refers to the Artisan or Craftsman class, and Bastidanne is of a higher social class. The costume which i made for Joan and which i will discuss today is of the Artisan Class. The costume consists of chemise, dress, petticoat, bloomers, stockings, shoes, apron, shoulder shawl, jewelry, mitaines, coif and wide hat, of straw in the summer and of felt in the winter. 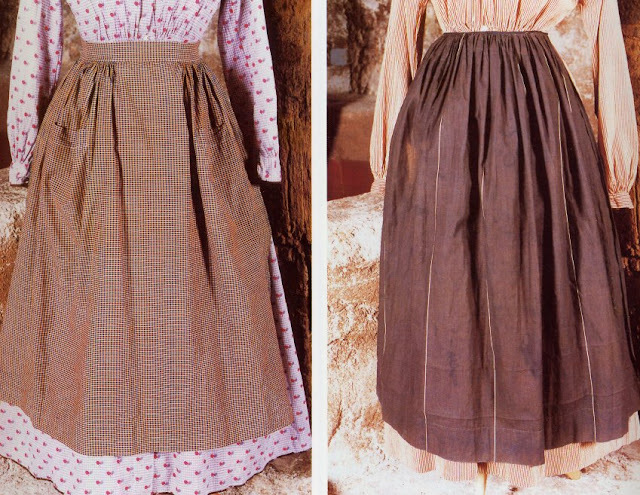 Here are two more examples of the costume, the first photo showing the everyday costume, and the second showing the Sunday or festive costume, which differ mostly in the quality of the materials used. The photo of the Sunday outfit shows the felt hat used in winter. 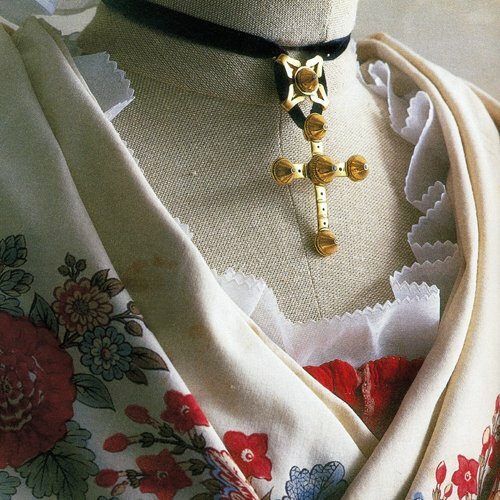 As in Eastern Europe, the chemise is the foundation of the costume, but here, little of it shows. Just the neckline, and the sleeves, if one wears a skirt and bodice, which is typical of the Peasant Costume, but not of the artisan. 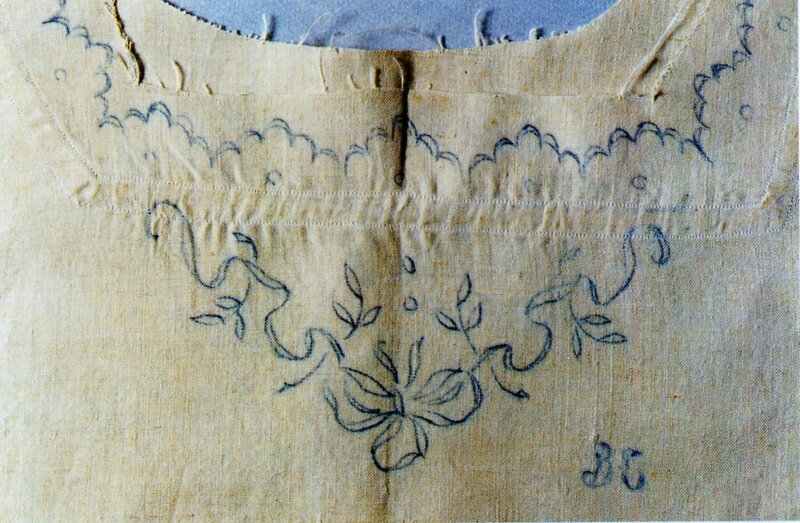 The neckline of the chemise has scalloped embroidery on the edge, and often has a ribbon threaded through a casing so that the edge is gathered. 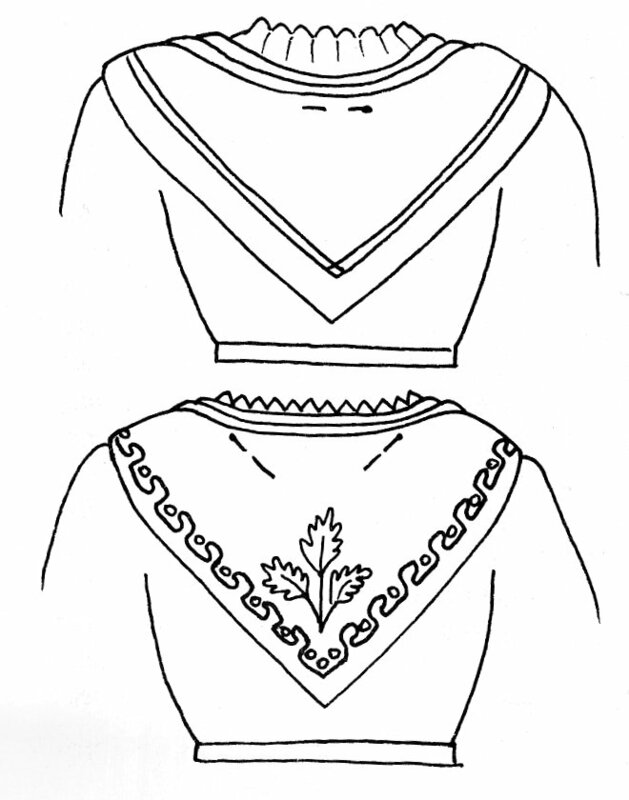 Unlike the counted thread embroidery which i am more familiar with, the scalloped edges and embroidered ornament found on these garments must be drawn on the cloth first, and then one follows the drawn design with satin stitch, cutwork, and other types of stitching. It is a peculiar tradition in Western Europe that the maker embroiders her initials on such garments, as well as on house linens and suchlike. 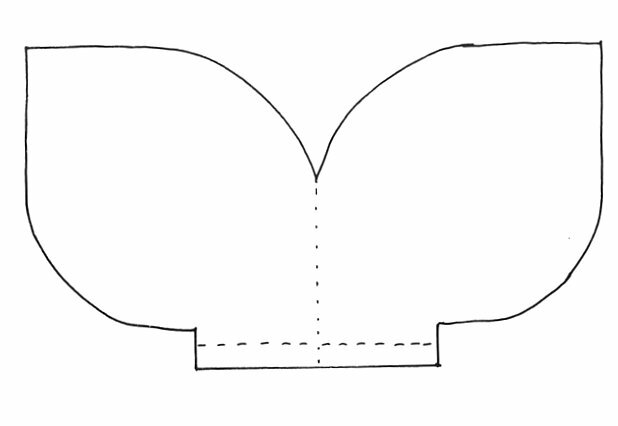 Here is the neckline of a chemise ready to be embroidered. 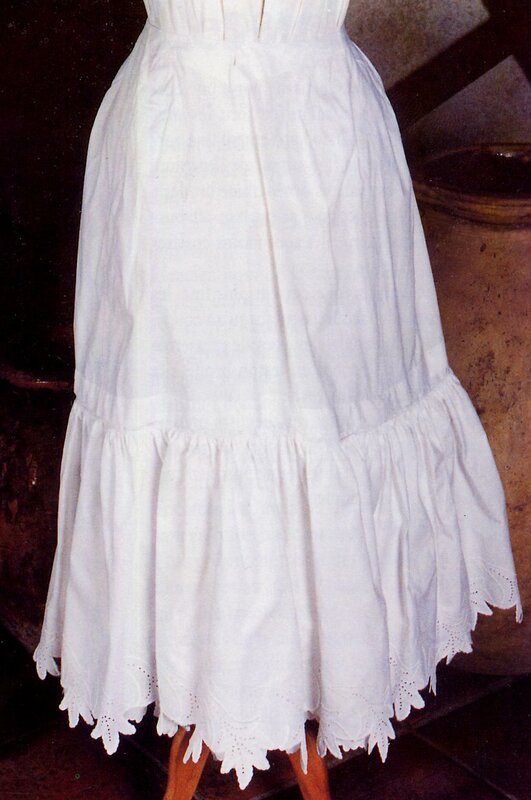 The chemise is made of fine white linen or cotton, the fineness of the material and embroidery depending on one's social class. 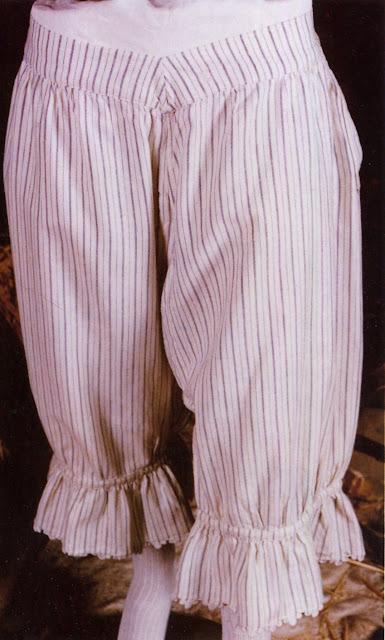 The sleeves are short, there are gussets under the arms, and triangular gussets are added at the sides of the bottoms to give more room for ease of movement. 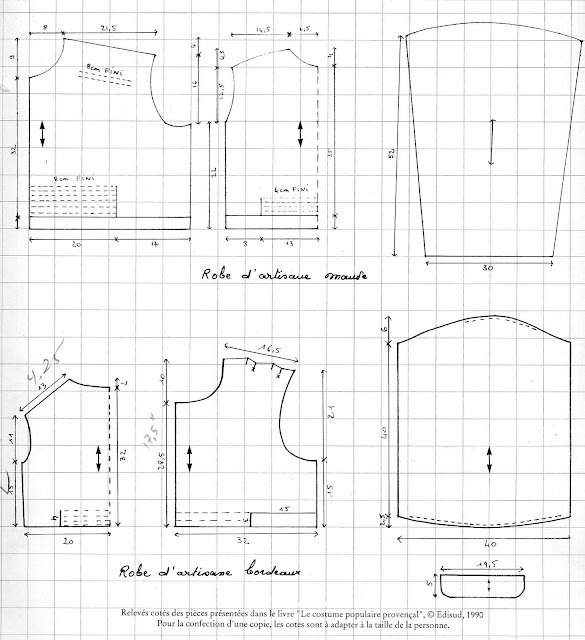 Here is a typical cut for the chemise. These triangles are cut from rectangles of cloth, There was always a concerted effort not to waste cloth. Under the chemise, bloomers were worn. For the higher classes, usually of white linen, for the peasants, often of a heavier cotton of stripes or colors. 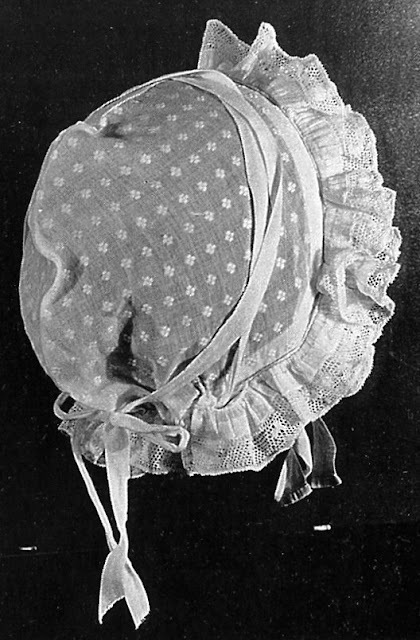 Heavier bloomers were worn in the winter time. They often had flounces on the bottom which were embroidered in the same way as the chemise neckline, or had lace attached to them. Over the chemise it was imperative to wear a petticoat. These varied quite a bit. Dress petticoats were quite full on the bottom and often had a froth of cutwork and scalloped edge embroidery. These were coquettishly shown off while dancing. Alternatively, the underskirt could be of knit or crochet, or even of a finely quilted material in cooler weather. Both the Peasant and Bastidanne costume more commonly feature a separate skirt and bodice or jacket, but the Artisanne prefers to wear an actual dress. These are made of the famous cotton prints of Provençe. Perusing the photos gives you some idea of the variety of pattens, and the quiet colors used. 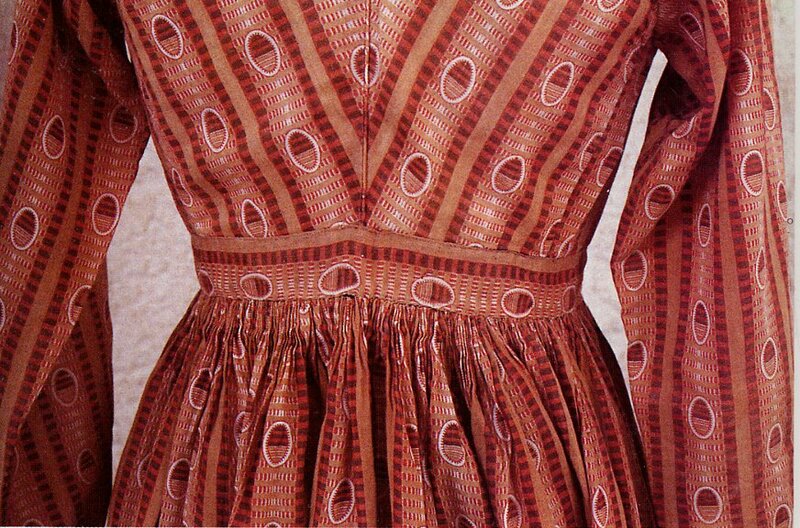 Here is a link to another blog with some very good photographs of Provençal printed material. The neckline varies, but it can be quite high, or it may be cut a bit lower so as to show off the embroidery on the chemise. 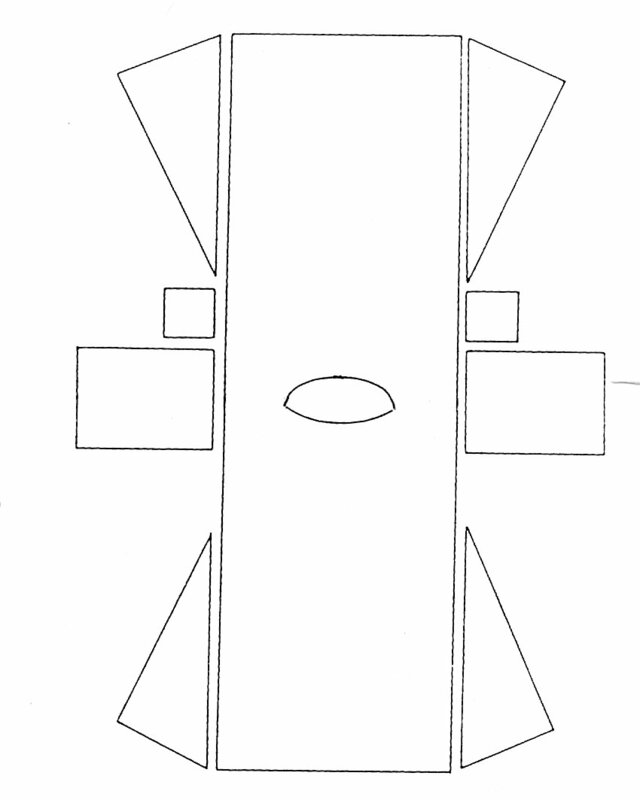 The sleeves are relatively narrow, and may even be fitted. The opening is in the front, and buttons up. The top is smocked into the waistband, and the skirts, which are very full, 4.5 to 5 m around, are also smocked into the waistband.The waistband is closed with a hook. The sleeves have cuffs which are also buttoned. 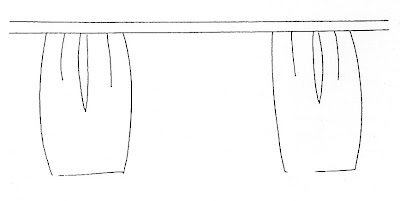 The bottom hem and the cuff may also have an ornamental edging. Occasionally, one will see a dress which is fitted, instead of gathered into the waistband, with the cloth cut on the bias. 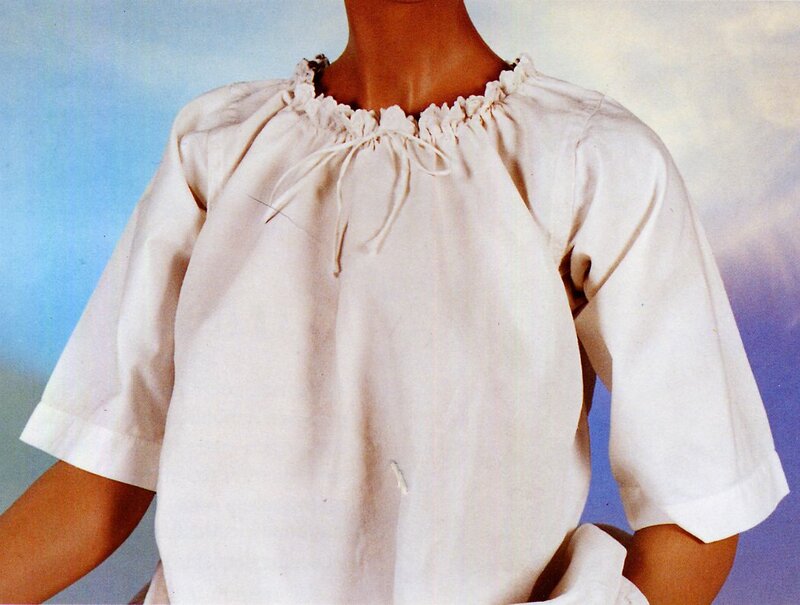 The cut varies somewhat, in particular, if the dress was made of silk, the sleeve was often cut quite wide on top, and then smocked, like a Spencer sleeve. But here are a couple of examples of the cuts which are used. Over the shoulders is worn a small scarf or shawl, the 'Fichu', which are square, 70 to 110 cm on a side. 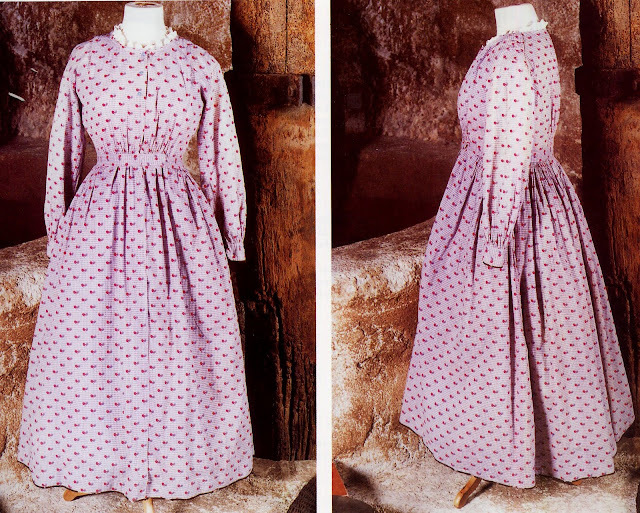 For everyday wear it was of a cotton print which matched or complemented the patten on the dress, and always had a border. For special occasions it was white with whitework embroidery, of chainstitch or tambour, or freehand floral embroidery. For examples, see the various images in this posting. 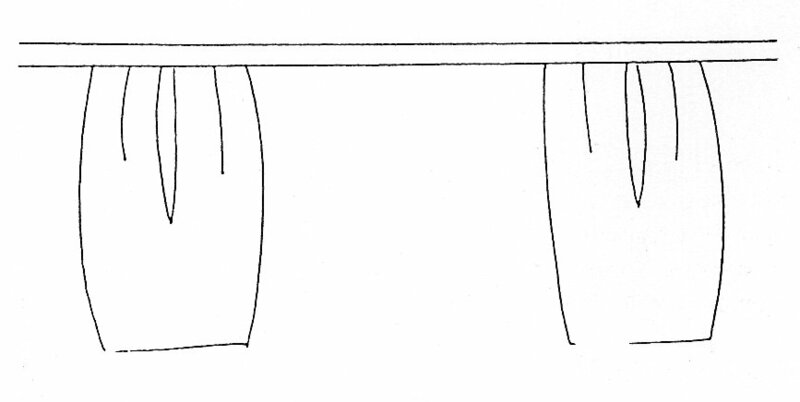 The fichu is folded in half diagonally, then three folds are made across the long edge, right on top of each other, the bottom two are secured with straight pins on the part which will be draped in front. 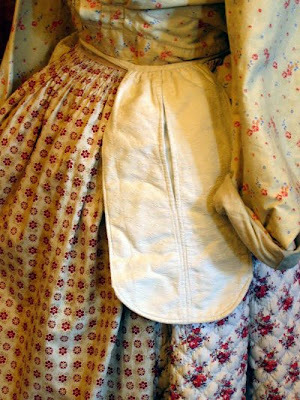 The fichu is then wrapped around the shoulders, the tip should not hang below the waistband in back. 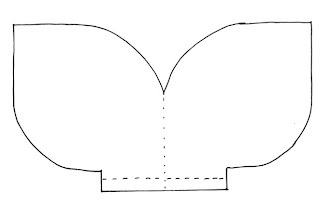 The ends cross at the waist in front, under the apron, and are pinned in place, and the back is pinned to the shoulders. [Be careful where you put your hands if you dance with someone wearing this costume]. This gives the fichu its particular shape. An apron is of course, always worn. The everyday apron is of coarser and more durable material of a plainer design. 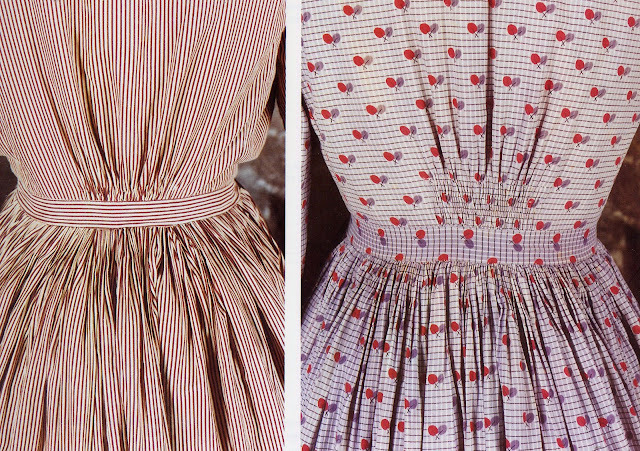 The everyday apron may have two patch pockets sewn to the outside of it, for convenience. 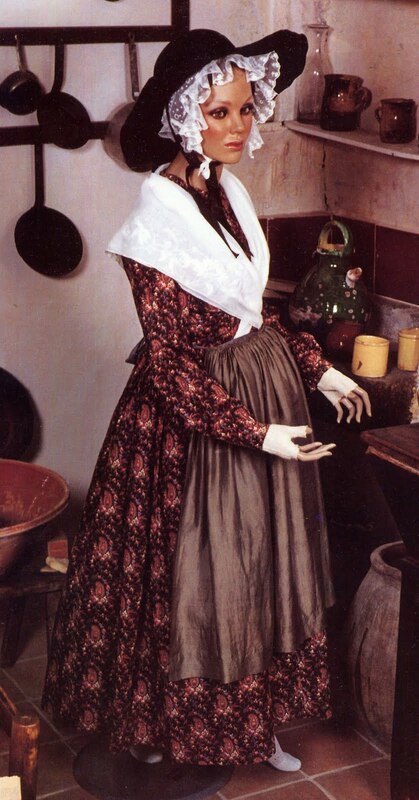 The apron tends be be roughly a meter or so wide, and should hang about 20 cm shorter than the hem of the dress. It is gathered into a waistband which is wrapped around the waist and tied in front, under the apron. The gathering may be only at the sides of the apron. When wearing a more formal version, one or two loose pockets on a separate waistband may be worn. These are not displayed, but hidden under the skirt or dress, which often has an opening along the seam to permit access, as they are not ornamented. [I will admit that i cheated and put a pocket in the side seam of the dress itself]. Long, finely knitted stockings, les bas, are worn under the bloomers. They feature openwork in the knit, or fine silk embroidery on the instep and ankle, which would show beneath the hem. Dress shoes are low and flat, of black leather, do not extend much up the instep and often had silver buckles or silk bows on the toes. For working, one would wear whatever footwear was appropriate. One distinctive feature of French costume are the mitaines. These are fingerless gloves which are worn as part of the traditional costume over a wide part of France. They supposedly were invented by women who worked in the lavender fields, to protect their hands while still leaving them the necessary dexterity of their fingers. Finely knit examples are part of the formal costume. They are usually white, although they may also be black or other colors. A wide variety of jewelry is worn on appropriate occasions, brooches, chatelaines, lockets, and especially crosses. One ornament which is very typical is a black velvet band around the neck with a very ornamental cross attached. This is part of France's rich Catholic heritage. Earrings are seldom worn, because the Coiffe generally covers the ears. These are made of fine linen with whitework embroidery, trimmed with lace which is often goffered. The cut varies, but it is generally small and fits rather closely to the head. The back is gathered, so that there is room for the hair, which is worn braided up on the back of the head. The face is generally framed with a lace frill of some sort. 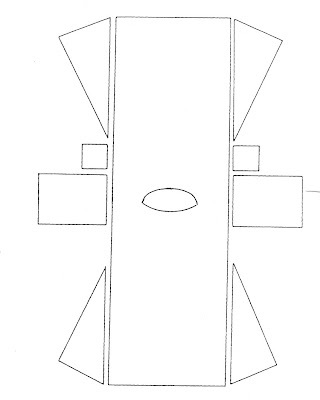 Here is one example of a layout and a couple of finished coifs. Others are visible in the various photos. Many of the components of French costume are similar in various provinces. Usually the distinctive feature is the headgear. 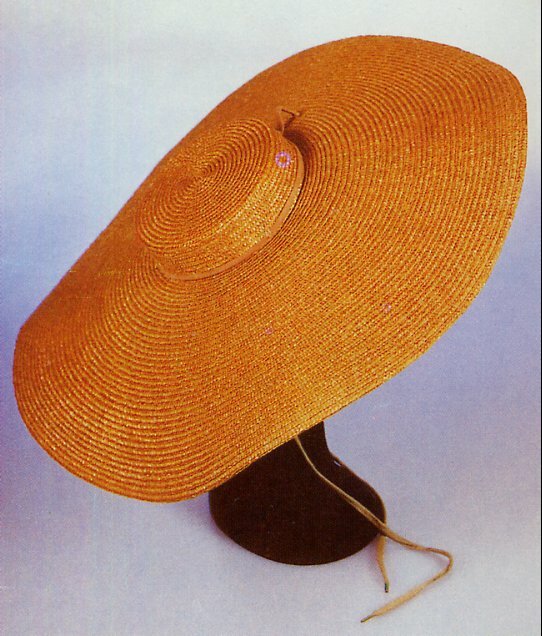 In Provençe it is a large flat straw or felt hat, either natural or black in color. 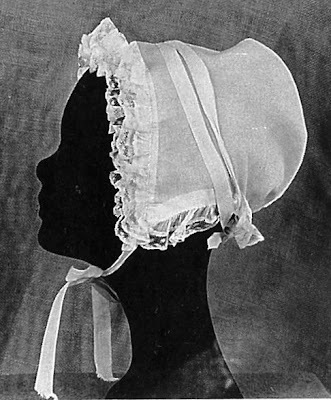 The brim is very wide, and the crown is short, with a dark velvet ribbon and bow around it. It has a string which can be fastened under the chin, but often it is allowed to hang over the lower back. It makes a fine protection from the sun. It is always worn over the coif. In the area around Nice, the hat is slightly conical and often has embroidered flowers on it. In the territory of Arles, the hair is braided and gathered on top of the head and covered with a tiny coif with lace rabbit ears, which then on special occasions has a rich wide ribbon pinned around it which hangs down the back of the head. This is called le Ruban. 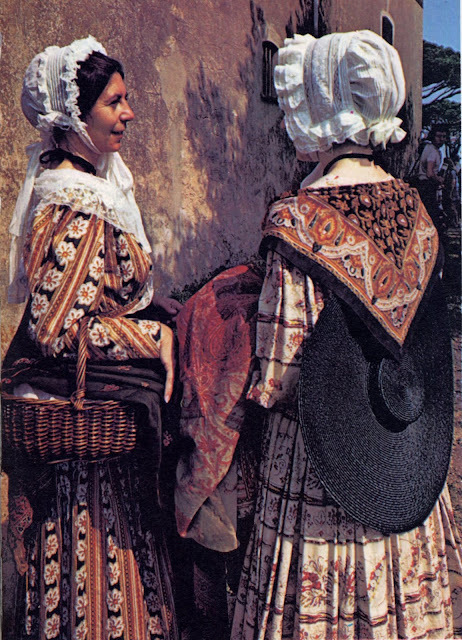 Here are a couple of examples of the hat of the typical Provençal costume. Both of these final photos show the Peasant version of this costume and show how the hat is often worn. 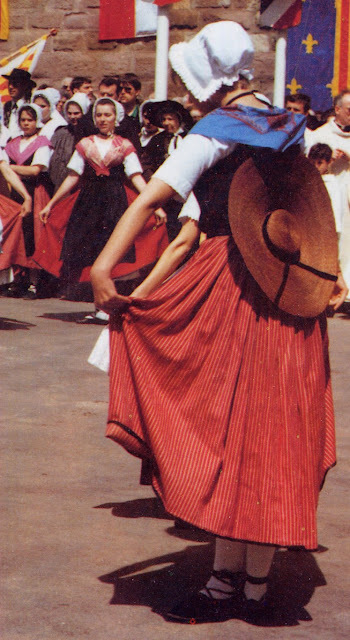 The following photo shows some dancers, note the espadrilles. Here is a final look at the outfit which i made for my friend Joan, which is being modeled in her garden by another friend of mine, Jean, after an all-French folk dance performance we did last year. Thank you for reading, I hope you have found this to be interesting and perhaps inspiring. Here are a couple of websites with more information about this costume. They show other variants of this costume as well as those of Nice and Arles. Here is one website where you can buy Provencal Fabric. There are others, especially if you can read French. Thank you very much for this marvellous blog that do the honour of Provence ! I big your pardon, my english is very bad) but this your is perfect ! Site "les petites filles modèles"
Bonjour Romain, je découvre votre blog grâce à mon amie Jany. Merci pour votre intérêt pour le costume provençal. En effet, je vois que vous avez repris les photos du "Costume populaire provençal" ouvrage de référence bien connu de tous les amateurs du Costume provençal.Je découvre la photo de votre ami Joan en costume. Dommage qu'il ait oublié de mettre sa coiffe sous le chapeau. Une provençale ne se présente jamais sans sa coiffe. C'était juste un petit détail qui a toute son importance. Bien à vous.